Students in F or J visa status may remain legally in the U.S. on an expired visa provided they have a valid, unexpired Form I-20 or DS-2019. 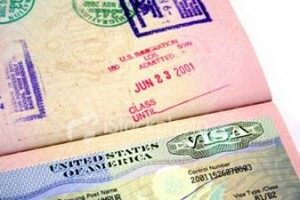 F and J visas cannot be renewed inside the United States. Students can apply for an F or J visa at a U.S. Embassy located outside the U.S. Before re-entering the U.S., all F and J students must provide a valid, unexpired visa at the port of entry. More information regarding visa renewal and Automatic Visa Revalidation are listed below. First, verify that your name, date of birth, country of birth and citizenship as listed on your I-20 form match what is written in your passport . If changes are needed on your I-20, submit a Request Form, along with the required documents, to the Office of International Programs 2 weeks before travel. Students should contact the U.S. Embassy they plan to visit for detailed requirements. Below are the basic documents needed to apply for the renewal of an F-1 visa. Active Form I-20 – must be signed for travel by an OIP DSO within one year prior to the re-entry date. Proof of full-time enrollment – Official transcripts and letter of enrollment from UM Registrar’s Office. Proof of current financial support – financial statements, affidavit of support from sponsor, and/or graduate assistantship or scholarship letter. Valid passport for a minimum of six months beyond the re-entry date to the U.S. Copy of I-94 card (front and back) or copy of I-94 Arrival Page. Visa application – form, fees, and photographs (according to Embassy required format). All immigration documents for F-2 dependents. Additional funds are needed for each F-2 dependent, thus the amounts on financial documents will need to be higher. Proof of relationship to spouse or children (e.g. marriage and birth certificate). If dependents apply for a visa without the presence of the principal F-1 student, they need to bring copies of the student’s SEVIS documents. Students must identify the visa application requirements for the Embassy or Consulate where they plan to apply for a visa renewal. Visit www.usembassy.gov for more information. Acquire all documents the Embassy or Consulate need to issue a visa. Reserve a flight that allows sufficient time to obtain a visa. Certain individuals may be subject to security clearances, which can result in delays of 20 additional business days or more. Students should be aware of the negative effect a delay may have on completing courses when traveling in the middle of a semester. Inform an OIP advisor of visa renewal plans a few weeks in advance. The advisor will verify student’s records, endorse Form I-20 for travel and issue a visa renewal letter. Preparation and organization is important during a visa interview. Students must be mindful that the purpose of a student visa is to study. They must also show they have reasons and plans to return to the home country. Not all Embassies accept third country visa applicants and the decision to accept applications vary throughout the year. Students must contact the Embassy prior to making travel plans and ensure their application is accepted. Canada and Mexico are popular locations for visa renewals and have various locations. Students may visit Nonimmigrants in the United States–Applying for Visas in Canada or Mexico for locations and information on how to make an appointment. Please note that citizens of countries designated as state sponsors of terrorism are ineligible to apply at an Embassy or Consulate at a U.S. border. The list of countries may be found at http://www.state.gov/j/ct/list/c14151.htm. Students who have violated their immigration status may not be eligible to apply for a renewal at U.S. border sites. Students who have applied for a visa renewal in a contiguous territory (Canada, Mexico and Caribbean Islands) and are awaiting a decision (visa has not been issued) may not re-enter the U.S. using Automatic Revalidation. Certain individuals will be subject to a security clearance and should expect delays of 20 business days or longer. If the visa application is denied, students cannot re-enter the United States until they obtain a new visa from the U.S. Embassy or Consulate in their home country. For pdf version of this information, visit F-1 Visa Renewal Information. First, verify that your name, date of birth, country of birth and citizenship as listed on your DS-2019 form match what is written in your passport . If changes are needed on your DS-2019, submit a Request Form, along with the required documents, to the Office of International Programs 2 weeks before travel. Students should contact the U.S. Embassy they plan to visit for detailed requirements. Below are the basic documents needed to apply for the renewal of an J-1 visa. Active Form DS-2019 – must be signed for travel by an OIP DSO within 6 months prior to the re-entry date. All immigration documents for J-2 dependents. Additional funds are needed for each J-2 dependent, thus the amounts on financial documents will need to be higher. If dependents apply for a visa without the presence of the principal J-1 student, they need to bring copies of the student’s SEVIS documents. Many students travel within and outside the U.S. during holidays and breaks. We encourage travel as part of the experience of being an international student. Please read the instructions before setting off on your adventures. Travel within the United States for any international student or scholar on a non-immigrant visa does not require any special documentation, letters, or any signatures from the Office of International Programs. Still, anyone on a non-immigrant visa should be able to present proof of their legal status within the United States at any time. It is recommended that for travel outside of Oxford you take your passport and at least a photocopy of your accompanying documentation (i.e. I-20, DS-2019). Also, it is recommended that you keep photocopies of your main passport page, visa page, and any other visa documentation with you at all times even when not traveling. Traveling to another country may involve obtaining an entry visa to that country. It is best to check the consulate website of the country you wish to visit to get the current visa procedures. To find visa requirements for another country, you should visit that country’s consulate or embassy website..
For Canadian visas, click the Government of Canada. For Mexican visas, visit the Secretaria de Gobernacion. For other visas, visit Visa HQ. To be able to travel outside of and return to the United States in F status, you will need to have a valid signature from either the Primary Designated School Official (PDSO) or the Designated School Official (DSO) on the last page of your F-1 or F-2 I-20 document. In the Office of International Programs both International Programs Advisors are DSOs. Anyone in F-1 or F-2 Status must visit the Office of International Programs at least one week before any travel out of the U.S. One week is necessary to allow the International Programs Advisor to sign your documents and to be able to process any changes to your I-20 before your travel. Travel signatures are valid for one year and must be valid on the date which you wish to return. Also, your I-20 must still be valid, meaning your program end-date must not have passed in order to be able to re-enter the U.S.
Additionally, F-1 students seeking to re-enter the U.S. must have a valid passport. Your passport must be valid for at least 6 months after the date you intend to return to the United States. If your passport is expiring, you should make plans to renew or extend your passport before your travel. With the exception of Canadian citizens and any F-1 or F-2 holder visiting Canada, Mexico, and the adjacent Caribbean islands for less than 30-days [22 C.F.R. § 41.112(d); 8 C.F.R. § 214.1 (b) (1)], a valid US F-1 or F-2 visa stamp in your passport is needed for return to the United States. The F-1 and F-2 Visa Stamps cannot be obtained within the United States. Visa appointments must be made with a consulate or embassy outside of the United States for the renewal or initial F Visa. It is recommended that students obtain a “Letter of Good Standing” from the Office of the Registrar before departing the country. This letter will confirm your enrollment with the University of Mississippi and confirm your expected graduation date. To be able to travel outside of and return to the United States in J status, you will need to have a valid signature from either the Responsible Officer (RO) or Alternate Responsible Officer (ARO) on the front page of your J-1 or J-2 DS-2019 Document in the Travel Validation Section. Anyone in J-1 or J-2 Status must visit the Office of International Programs at least one week before any travel out of the United States. One week is necessary to allow the International Programs Advisor to sign your documents or to make any changes to your DS-2019 before your travel. Travel signatures are valid for one year and must be valid on the date which you wish to return. Also, your DS-2019 must still be valid, meaning your program end-date must not have passed in order to be able to re-enter the United States. Additionally, J-1 students seeking to re-enter the United States must have a valid passport. Your passport must be valid for at least 6 months after the date you intend to return to the United States. If your passport is expiring, you should make plans to renew or extend your passport before your travel. With the exception of Canadian citizens and any J-1 or J-2 holder visiting Canada, Mexico, and the adjacent Caribbean islands for less than 30-days [22 C.F.R. § 41.112(d); 8 C.F.R. § 214.1 (b) (1)], a valid US J-1 or J-2 visa stamp in your passport is needed for return to the United States. The J-1 and J-2 Visa Stamps cannot be obtained within the United States. Visa appointments must be made with a consulate or embassy outside of the United States for the renewal or initial J Visa. It is recommended that J-1 Students obtain a “Letter of Good Standing” from the Office of the Registrar before departing the country. This letter will confirm your enrollment with the University of Mississippi and confirm your expected graduation date. J-1 Scholar Researchers/Professors can obtain a letter for travel from the International Programs Advisor for faculty and scholars. The letter for Researchers/Professors will confirm affiliation with the University of Mississippi. You must obtain a signature for travel from the institution that issued your DS-2019 or I-20 in order to comply with Department of Homeland Security regulations. You should plan obtain signatures from your DSO/PDSO or RO/ARO well in advance of your intended travel, to allow enough time send your documents to your institution and for your DSO/PDSO or RO/ARO to mail your documents back to you. You should also inform the University of Mississippi, Office of International Programs of any plans to travel.